You may have heard of the Scottish tradition of First Footing — that to start the New Year off right, the first person to cross your threshold should be a dark-headed male, carrying salt, shortbread, coal, black bun, and a dram of whiskey. As I am married to a dark-headed male of Scottish descent, the threshold-crosser part of the tradition is taken care of (although we have never gone so far as to have him bring in the requisite items). For my own take on the tradition, I go for a walk and watch for the first wildlife I see. I think of them as my First Footers for the year. 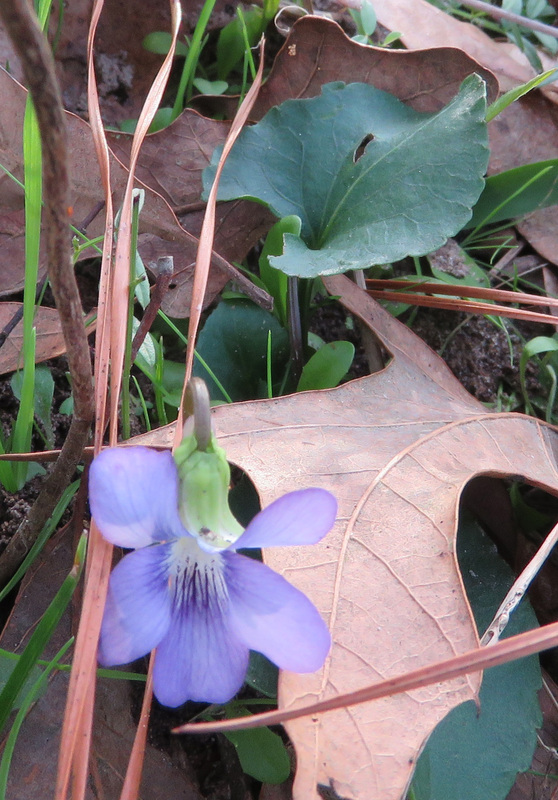 First wildflower of the year, Violet. There were many small insects I couldn’t get a good look at. 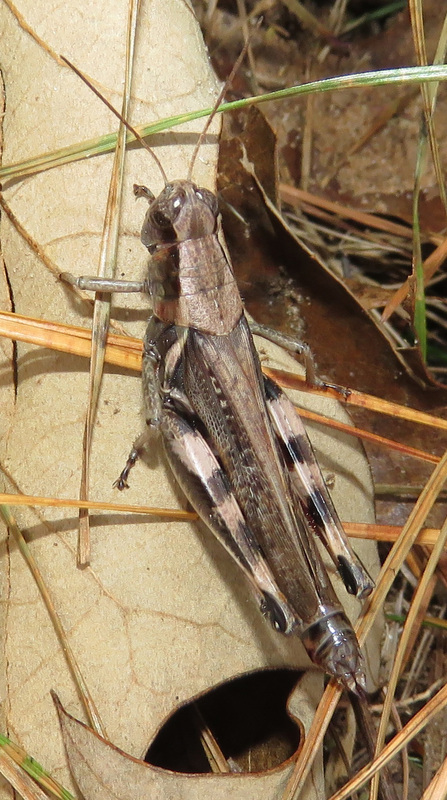 When I stopped to take a picture of this grasshopper, I noticed it had a companion in the pine needles. First insect of the year, a grasshopper. It was a beautiful little Flat-backed Millipede. Quite often I see dead millipedes wrapped around the tops of twigs — it’s like they were caught by bad weather and didn’t get down to safety, whatever that is for them. But this one was meandering through the needles and I got plenty of pictures. First invertebrate of the year, Flat-backed Millipede. It was not much bigger around than the pine needles, so I couldn’t see the details until I looked at the pictures on the computer. It was amazing to see the orange outlines around the alternating segments, and the little orange dots on some of them. 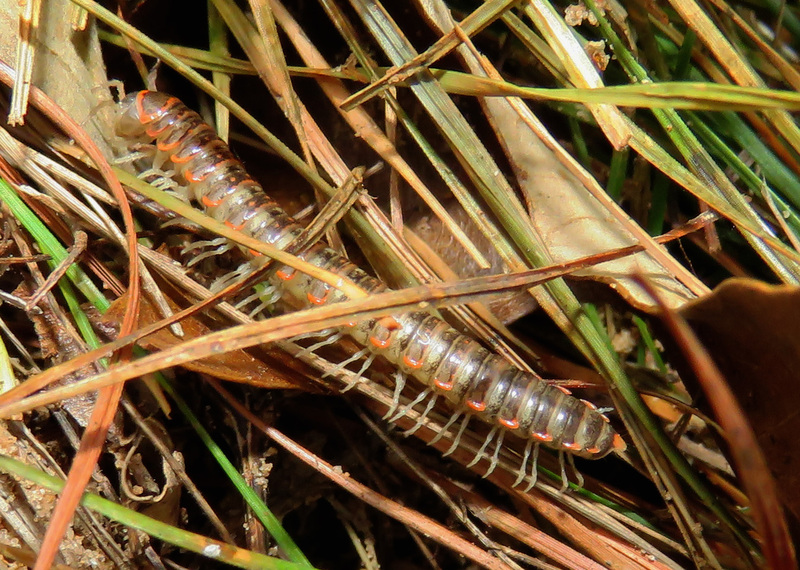 Millipedes eat dead vegetation, so they are important in helping break down the fallen leaves and needles. Of course they don’t really have a thousand legs. This one has somewhere in the vicinity of 80. 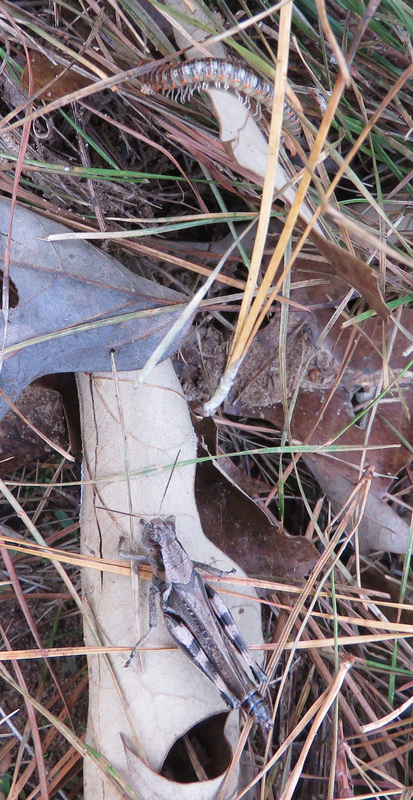 But since I was looking for my First Footers, it amuse me that I found one with so many feet! Good tidings for your new year. I learned in a nature class that centipedes have mouths in front, and that means they can and will bite you; but millipedes have mouths on the bottom, and that means they are vegetarians and won’t bite. So I felt fine with millipedes. But in researching for the post, I learned that some species at least can exude noxious fumes and liquids, even cyanide! So now I am more wary of them. Interesting. But still creepy! I guess like most things, I don’t mind them outside, but they don’t belong in the house, Scottish or not! well, you have a point!